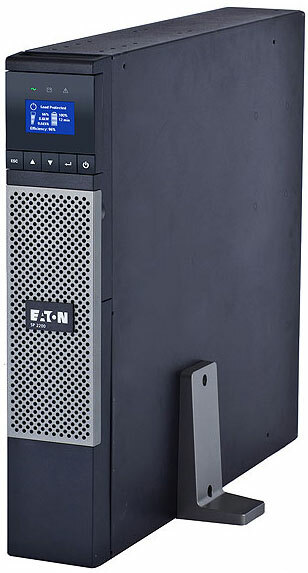 The Eaton 9PXM UPS is a scalable, modular, flexible solution that combines the highest level of reliability with the lowest cost of ownership in the 4–20 kVA range. 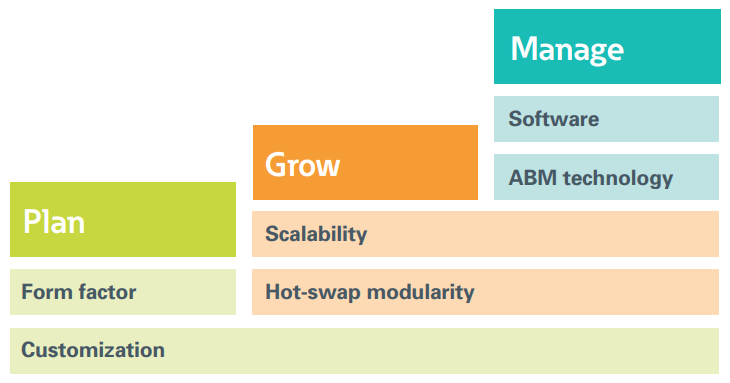 The 9PXM enables you to build a power solution specific to your needs and to expand redundancy and runtime as your needs change. The plug-and-play power and battery modules are user replaceable so you can add them as needed without a service call or having to put a redundant system in bypass. With its low initial investment, online double-conversion technology, Eaton ABM technology and high efficiency mode, you never have to compromise reliability for efficiency. Hot-swappable power and battery modules are lightweight, allowing users to replace modules in normal operation mode without a service call. N+X redundancy design provides high reliability and eliminates potential for single-point of failure. The versatile 9PXM is well suited for both the IT marketplace and for industrial/commercial applications. 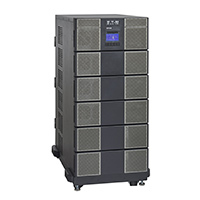 The 9PXM’s high power rating, small footprint and easy rack conversion make an ideal solution for an array of data center applications. 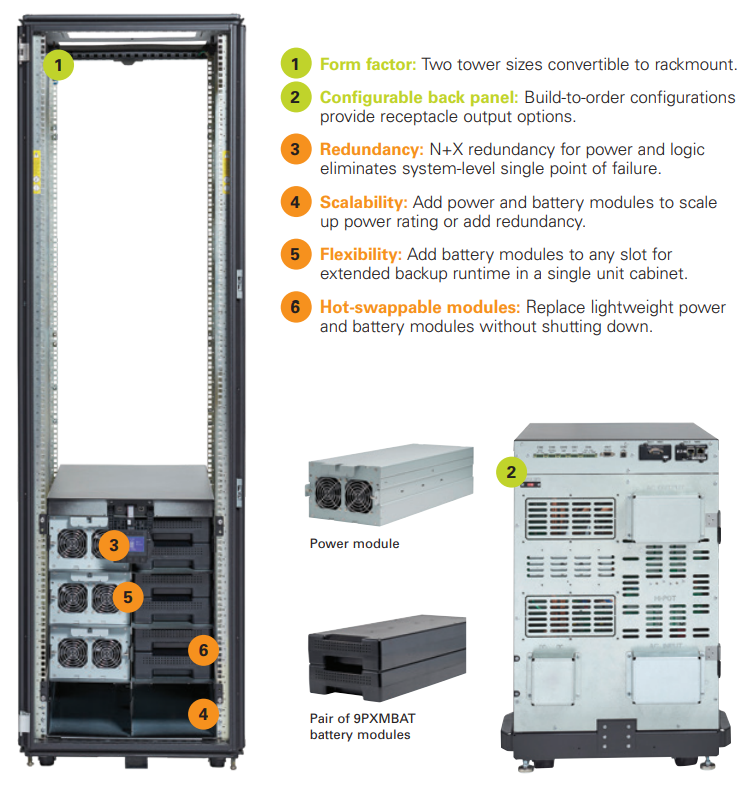 The design features offer harmonious compatibility with 4-post or high density racks, PDU and network gear for seamless integration into an IT infrastructure. The 9PXM is rugged enough to stand up to mission-critical applications, and it’s small footprint, customizable output options and N+X redundancy are valuable features in the retail, financial and government sectors. 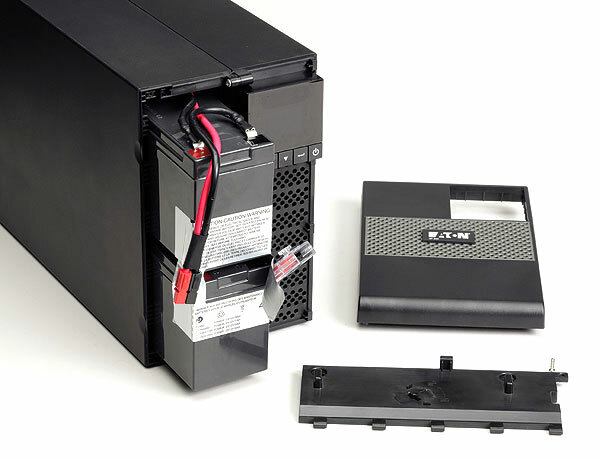 Build a power solution that is specific for your needs. IPM is an on-site policy-based automation software platform that triggers advanced remediation actions—like shedding non-critical workloads to extend battery runtime—during a power event to ensure that critical equipment remains running as long as possible. In other words, IPM automatically takes action when it notices something awry—once configuration and action policies are set, IPM does the work. 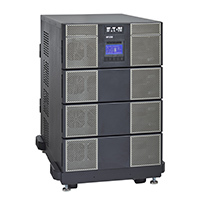 This increases uptime and saves time and money by allowing you to remotely solve power issues. VPM excels at remotely monitoring large and distributed deployments of power devices. 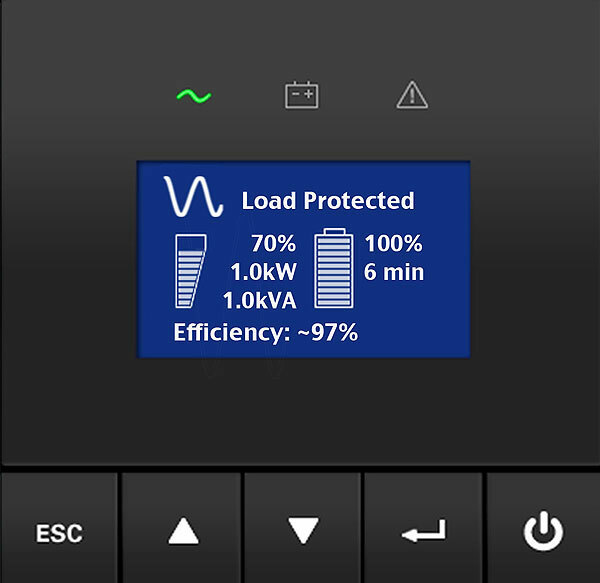 The easy-to-use, visual interface provides a live floorplan view with alarm notifications for up-to-the-minute health status on your power infrastructure. Use VPM to better visualize your power infrastructure allowing you to take action as needed to maintain continuous uptime of your critical applications. VCOM, our data center system optimization (DCSO) platform, provides our greatest level of business intelligence by monitoring both IT and facilities power infrastructure which makes it ideal for large or multisite management. 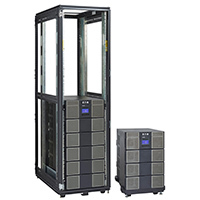 VCOM features capabilities designed to reduce data center operational expenses, improve system and application reliability and mitigate risk through data analysis. You can select a configure-to-order (CTO) number to reflect the cabinet form factor and output configurations. As you select the options needed, they become part of the CTO number. Order power modules, battery modules, external battery cabinets, bypass switches and other external options as separate line items. Output connection configuration is designated by five digits within the unit CTO number. These five digits allow selection of the type and quantity for up to a maximum of five different types of receptacles. 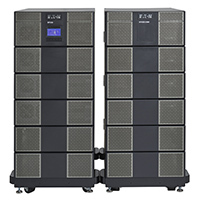 For hardwired output, use AAAAA for a 12-slot cabinet and AAXXX for an 8-slot cabinet. 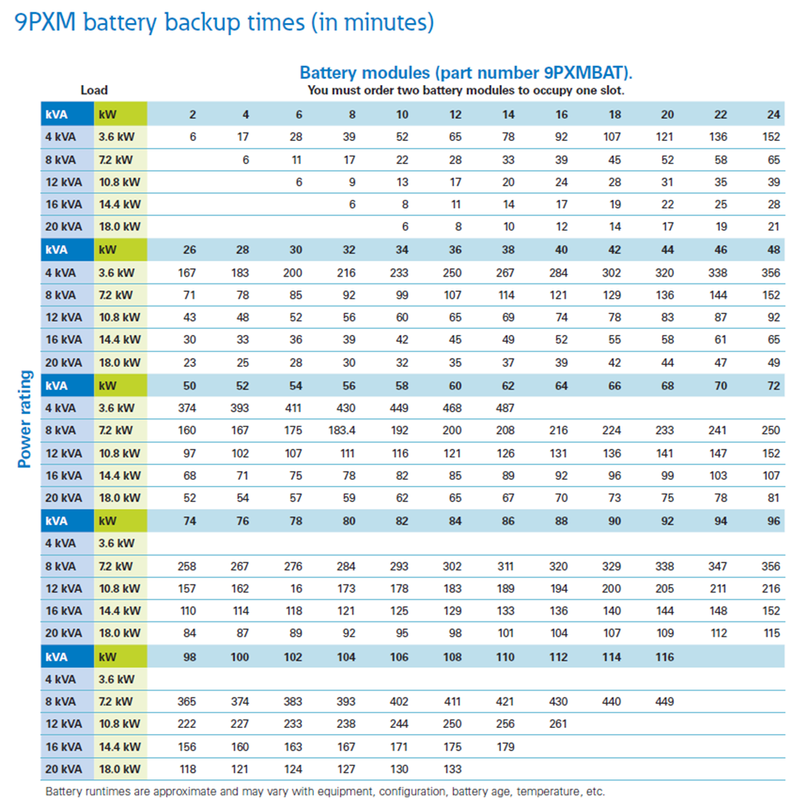 Download the Eaton 9PXM UPS Brochure (PDF). 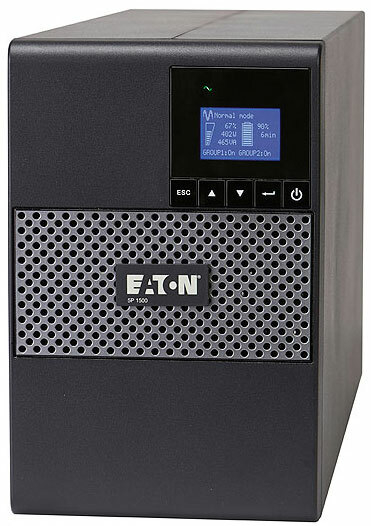 EatonGuard.com is a division of Virtual Graffiti Inc, an authorized Eaton online reseller.